Mumbai, March 21: With the festival of colours - Holi 2019 - coming to an end, United States Consulate in Mumbai on Thursday celebrated the festival by remembering former Indian Premier Pandit Jawaharlal Nehru applying colours to America's First Lady Jacqueline Kennedy in 1962 on occasion of Holi. Holi 2019: Pakistan PM Imran Khan Extends Wishes to Hindu Community on Festival of Colours. 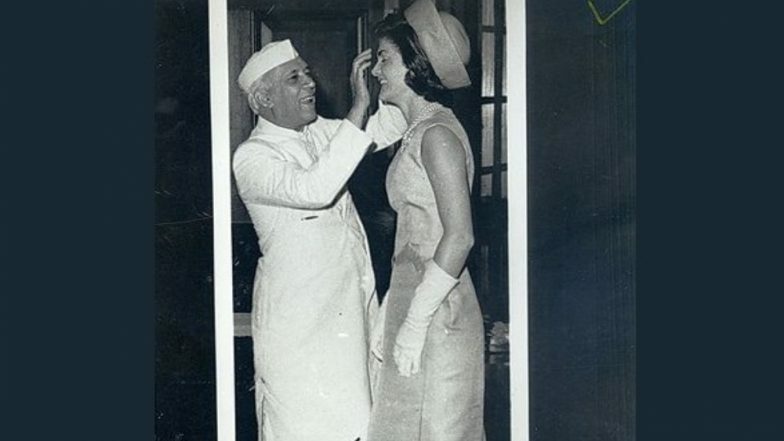 The image that was shared by the US Consulate Mumbai on its Twitter page shows Pandit Nehru applying colour to the then First Lady, wearing a smile on face. Also, Mrs Kennedy can be seen accepting the colour as a goodwill gesture. Happy Holi 2019: PM Narendra Modi, Rahul Gandhi, Other Politicians Extend Their Wishes on Festival of Colours. Along with this, the US Consulate also shared images of families of the consulate playing Holi. Employees of the embassy were seen happy while playing with colours.